And this good cup of coffee comes from my Breville BES870XL Barista Express Espresso Machine! I loved coffee all my life, but had mostly used the filter machines. They don’t really give you great coffee. Once in a while I picked up Mc Café coffee, which is pretty good. Starbucks I never liked. There is something about their coffee that just does not taste good to me. And for me to throw a cup of coffee away – that has never happened before, until the day I was at the airport in Miami and I could not find anything else but Starbucks coffee. So I gave in, spent a fortune on that coffee and tasted it – igittttt! So I added sugar and milk – but to no avail – it just tasted terrible – way too bitter and acidy.
. I always wanted to have a coffee machine that gives me one cup at a time. So I scoured the internet for 2 months, reading every review I could find on different machines. First I thought maybe the Keurig would be a good option, because we had one in the office and you had the choice of different flavors. But then you have all those wasted plastic capsules. I did not want that. They did have a universal cup you could fill with your own coffee, so I was thinking about it until my friend told me that they do not last very long. She had a Nespresso, but you end up with the same problem of the wasted empty capsules, and the universal filter is terribly expensive and then you still had to buy the stickers to close the top. So that was out for me too. and I thought, well, I might be able to do that. I had never made my coffee like they do in a coffee house, but I was willing to give it a try. I had read a few really good reviews. And in the best one the guy said to not just let the coffee grinder grind the coffee automatically, but push it by hand, shake it and then add some more coffee before you press down with the damper. It took maybe 3 cups of not so very good coffee until I had the grind strength adjusted, but since then every cup turned out delicious. The only thing to watch out for, if you have a different brand of coffee, you probably need a couple of cups until you find the right grind setting. Other than that, this machine has worked flawlessly! Searching online for any product is a good idea. There are so many websites with product information and reviews of products out there. I never buy a product on impulse. First I search for a product, compare it with other similar products and most of all, read tons of reviews – good and bad. It also helps, if you have friends that use the product I am looking for or at least a similar one. website and take the feeds also? I am glad to search out so many useful info here within the post, we want develop more techniques on this regard, thank you for sharing. You are welcome. Working on more reviews. They will be up in the future. Marvelous, what a bloig it is! This website gives useful information to us, kewep itt up. Thanks, I am working on some new almost paleo recipes and will be posting them in the future. Thank you. I only write reviews on products I use myself. There will be more reviews in the future, so stay tuned. Attractive section of content. I just stumbled upon your website and in accession capoital to assert that I get actually enjoyed account your blog posts. Hi, thank you so much for your encouraging words. I hope you had a great holiday. Being quite busy during this time I did not write as much. But I have some great recipes and some articles I will be posting shortly. Hope to see you back soon. Have a wonderful day! other hand, maybe you think doing all of that is a pain in the neck. a simultaneous brewed cup of espresso and milk steaming capabilities. The money spent on a coffee maker is well worth it. Just think of all the money you would spend on take out coffee. And with all the information you can get on the internet, buying a good coffee machine is not so difficult. Regarding your question, through copywriting I have learned that the easiest way to start writing, at least for me, is thinking that I am talking to my sister about something. Ask yourself the question, ‘If I talk to a friend or family member, do I have to look for words?’ Mostly the answer is no. So imagine you are starting a conversation when you are writing and the words will likely come. Good luck with your writing. This piece of writing will assist the internet users for building upp new weblog or even a blog from start to end. that it is tuly informative. I am going to watch oout for brussels. Thank you very much. I will certainly write more blog post. Thank you very much for your kind words and forwarding my blog. Your mode of telling the whole thing in this article is actually nice, every one can effortlessly be awre of it, Thanks a lot. helpful hiknts for first-time blog writers? I am not sure what hints I could give to you. But for me to write, I have to be passionate about something. I then read a lot about the subject and form my own opinion, which I then write on my blog. Hope this helps a bit. clicked the -Notify me when new comments are added- checkbox and from now on every time a comment is added I recieve four emails with the same comment. Hi Rochell, I am looking into the problem you are having. I am not an expert in WordPress, so I hope I can resolve that for you soon. Just a question, is there an unsubscribe on the bottom of that email? If so, you might need to unsubscribe from there. So far I have not found access to the comment writers in order to change anything. But I keep on researching if I can find a solution. Thanks , I have just been looking for information about this subject for ages and yours is the best I’ve discovered till now. But, what inn regards to the conclusion? Are you sure in regards to the supply? Thanks. As to your question, I am not sure what you are asking about the conclusion or supply. Can you clarify your question? regarding its size and colors etc. The Breville does not notify you to add more water or beans, but it has a Clean Me light whenever it needs to flush and clean the machine. sure that you know what a cappuccino consists of. On the other hand, maaybe you think doing all off that is a pain in thhe neck. It all depends if you drink cappuccino. We prefer espresso, so the milk steaming option is not that important. That huge savings makes a big difference when financial times are hard. this they are high in demand at different restaurants, hotels and coffee shops. as it grinds and squeezes out your espresso. I am not sure about using this machine in a restaurant. It does need cleaning very frequently and it is just the 2 of us. If there are hundreds of people drinking coffee you will be cleaning the machine every day. Not very practical. This machine is meant for home use. with same convenient feature in so reasonable price. I have not checked out the Gaggia machine, so I cannot comment on that. But as with any purchase, be well informed before you buy. That saves you a lot of aggravation later on. one thing. So, let me tell you about the professional grade, Jura Capresso Impressa z5 espresso machine. Those true-blue espresso and coffee enthusiasts enjoy having the very best espresso machine in their home. As with every coffee machine, there are pros and cons. Not having tried the Jura I cannot comment on it. 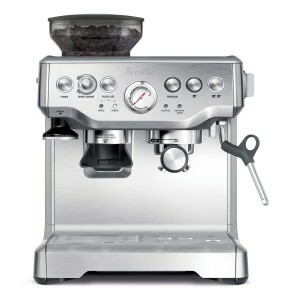 But I am very happy with Breville. Thank you. I am not quite sure I understand your question. Can you elaborate on it a bit? Hi colleagues, how is the whole thing, and what you desire to say regarding this piece of writing, in my view its genuinely amazing in favor of me. Hi, your cousin must have come across my web blog. I am glad you could benefit from it. you’re in realityy a juet right webmaster. The webb site loading speed is incredible. It sort of feels that you’re doing any distinctive trick. Also, Thhe contents are masterpiece. you’ve performed a wonderful job iin this subject! I was able to find good advice freom your bblog posts. you’re saying and the best waay wherein you say it. I blog frequently and I seriously appreckate your content. mark your boog and keep checking for new information abou oncfe per week. fantastic piece off writing at at this place. It’s going to be end of mine day, but before ending I am rezding thiis grewat article too improve myy knowledge. Any suggestions or advice would be greafly appreciated. Try WordPress or any other free web blog. If you want your own domain, you have to spend some money to get the domain and also with WordPress to host your domain. If you do, invest in the ‘All in One SEO’, it is worth it. Great work! That is the kind of info that are meant to be shared cross the web. hello there annd tank you for your info – I’ve certainly picked up anything new from right here. I could get it to load properly. I had been wondering iff your web hostying is OK? of yoour respective fascinating content. Make sure you update this again soon. its okk to use some of your ideas!! Do you mind if I quote a few off yohr posts as long as I provide credit and sources back to your weblog? I don’t mind at all, provided we are in the same niche, so we can benefit from each other. I was looking for this particular info foor a very long time. This is a topic which is near to my heart… Best wishes! Whrre are your cotact details though? I am rreally grateful too the owner of thi web site who has shared this great piece of writing at at this place. out more. Thank you for magnificent information I was on the lookout for this info for my mission. of writing, while I am also zealous of gertting familiarity. We stumbled over here differeent website and thought I might as well check things out. option? Thee are so many choices out there that I’m totally confused .. Thanks. Starting with a free WordPress site is a good option. Try to choose a good name for your blog and write frequent posts and add pages. Also choose a subject you are passionate about. It makes writing much easier. Currently it seems like WordPress is the top blogging platfrorm available right now. Yes I am using WordPress but through an affiliate site that hosts my web blogs and also provides the ALL in One SEO for search engine optimization. or suitable for multiple cups. I am not familiar with that coffee machine, but I am not a fan of everything being connected to my computer or phone. Thank you very much for the kind words and I am looking forward to having you come back. shops all use a similar process to produce the extract from bean we commonly call espresso. I try to keep blog post between 300 and 500 words. This keeps most peoples attention. hoping maybe you would have some experrience with something like this. Wow, superb blog format! How lkng have you been blogging for? Thank you very much. I have been writing for a long time, so a blog was the natural way to go. Heya!I realize this is sort of off-topic but I needed to ask. basis. I’d like too start a blog sso I can easily share my own explerience and views online. aspiringg blog owners. Appreciate it! mmy know-how here with colleagues. get the dangke of it! If you have questions, feel free to ask them. I am here to help in any way I can. The Pasquini Livia 90 Machine delivers it all with a simultaneous brewed cup of espresso and milk steaming capabilities. An important factor when you start looking for the best coffee machine available is making sure that you know what a cappuccino consists of. I am not familiar with the Pasquini machine, so I cannot comment on it. And as I wrote in a previous comment, we prefer espresso to cappuccino, so it is not important for us to have that feature. Thank you very much and I am looking forward to having you come back. Hi, as long as you credit my site for the ideas, you are welcome to use them. You are welcome. As you can see you are not alone with your problem. Good luck. I really appreciate your nice words and I am glad that you enjoyed my website. Hopefully I will se you back in the future. Thanks again. Danke. Ich schaue auch viel Amazon Prime Videos und habe im Kindle auch das App fuer den ARD gefunden. Jetzt kann ich auch Deutsche Serien schauen. could I wish to counsel you few interesting issues or advice. I have not been writing for some time, but now I am starting to post more articles again. Yes, I am using WordPress. It is easy to use and has tons of templates. Thank you very much. I am glad I could help. Thank you so much for your kind words. Even I have not been able to write for a few weeks, I am back and addressing some interesting issues. Thank you very much, glad to help. Thanks for the feedback. Which IE are you using? I have not found the same problem in any of my computers. But I will keep on checking.